(Cos Cob, Conn.) – November 8, 2018 – On November 11, the nation honors the thousands of men and women who served in the United States Armed Forces. According to 2016 data released from the Department of Veteran Affairs, a little over 20 million veterans make up the U.S. population. Of this population, 4.2 million are recognized as Post-9/11 veterans. Janine Lutz’s son, Janos V. Lutz – a Lance Corporal in the U.S. Marines, serving in both Afghanistan and Iraq – had numbered among them until taking his own life due to the detrimental effects of PTSD and over-prescribed medication. “Janine is a proud Marine mom. What’s sobering is that her son did not lose his life on the battle field, but here at home,” said Laura Saggese, founder of the cause promoting nonprofit, Wrap for a Cause. Saggese’s nonprofit increases other nonprofit organizations’ marketing visibility by wrapping vehicles with their logos and hash tags through sponsorship opportunities with area businesses or universities. In March 2014, Lutz started a support system for veterans in Davie, Florida. The concept of Lutz Buddy Up is simple: connect veterans locally by building a network of comrades who form life-long bonds by providing peer support, community building and overall well-being. What began as a small group of four veterans encouraging each other has swelled into a respected organization, with over 500 members in the Broward, FL chapter alone. In addition to Lutz Buddy Up, the foundation organizes nation-wide awareness campaigns and advocates for veterans’ interests in local and state government. One result of their advocacy is a partnership with local Florida municipalities to implement Vet-Connect, a tool for first responders that builds a bridge between law enforcement/first responders, veterans and local resources. Tim Jonas, owner of the vehicle wrapping business Nomad Wraps in West Palm Beach and Matt Crane, lead designer at Demented Graphics in Jupiter, FL are strong supporters of the Lutz Live to Tell Foundation. 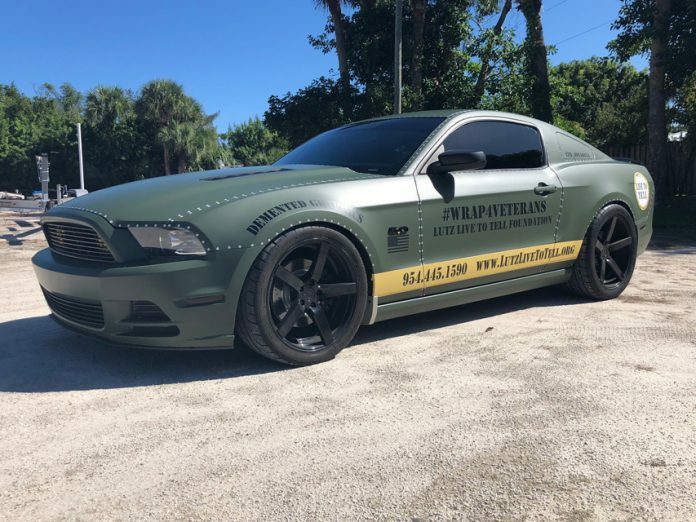 It was their desire to promote the foundation’s mission that secured a partnership between Wrap for a Cause and the organization, resulting in a U.S. military-themed 2013 Ford Mustang GT wrapped in Matte Military Green, the Lutz Live to Tell Foundation logo and the hashtag #Wrap4Veterans. Wrap for a Cause, Lutz Live to Tell, Nomad Wraps and Demented Graphics have partnered and wrapped the Mustang to promote greater veteran and first-responder support in time for Veterans’ Day. The Lutz Live to Tell Foundation Ford Mustang will debut at the renown Combat Veterans Motorcycle Association Florida State Rally, held at Seminole Harley Davidson in Sanford, FL on Friday, November 9. The tank-inspired car will then be at Cars and Coffee Palm Beach motor vehicle show on November 11, followed by participation at the fifth annual Patriot Run on November 17, beginning in West Palm Beach and concluding in Key Largo, FL. The mission of Wrap for a Cause is to help local and national nonprofit organizations create awareness with a memorable, viral campaign that raises funds and awareness using vehicle wraps. Interested sponsors of the Lutz Live to Tell Foundation Wrap for a Cause holiday campaign or interested organizations may visit wrapforacause.org or call 1-888-392-9729. -Image Source: Sign Builder Illustrated.